Location: Not too far from my stash! I recently put this pattern up as a free Ravelry download, if you are a member and are interested, you can find it there in pdf form. My Ravelry user name is needlenhook. Yarn: Bernat Cottontots (or any comparable worsted weight yarn), Approx. 50 yards MC and small amount CC for trim. Gauge: Not crucial for this project. This works up very quickly, so your washcloth can be your gauge swatch! Rows 3-15: Rep row 2. Do NOT fasten off. Finishing: Still using MC, sc evenly all the way around the washcloth, putting 2 sc in each corner sp, end by sl st to beg sc. Fasten off. Attach CC anywhere on the outside edge and reverse sc (also referred to as crab stitch) all the way around the washcloth. When you finish the last st, do not knot the end, just pull the tail all the way through. This will make for a cleaner edging. Weave ends in. Wa-la! Copyright 2008 by Theresa Grant. This pattern is for personal use only. Feel free to make it for your family and friends, but it may not be used for profit in any way shape or form. I love this pattern.. I have made some already.. So soft!! Wow, they look almost EXACTLY like ones that i've been doing for the last few months - right down to the crab stitch and the contrasting colors(although my stitch is slightly different)...just gave two sets for baby shower basket add ins and everybody LOVED them! Wow! Great minds think alike! I started making these a couple of years ago for baby shower gifts. I knew the stitch pattern was perfect for washcloths, and am not surprised that you have something similar, but the crab stitch too? Way cool. You're not kidding! I looked and experimented for months to find a stitch I though was perfect - I wound up going with sc, dc rep across, but I don't skip - I love the soft little bubbles they make! Thank you so much for sharing the pattern. They look wonderful to make. i think I may be able to even make these!! I love them! I love these ---- whew, my queue at Ravelry is getting WAY too long!!! I love the pattern for baby washcloths! We are expecting our first grandbaby (Abby) in Selpt. What is raverly? I am new to the board, and new to blogs. 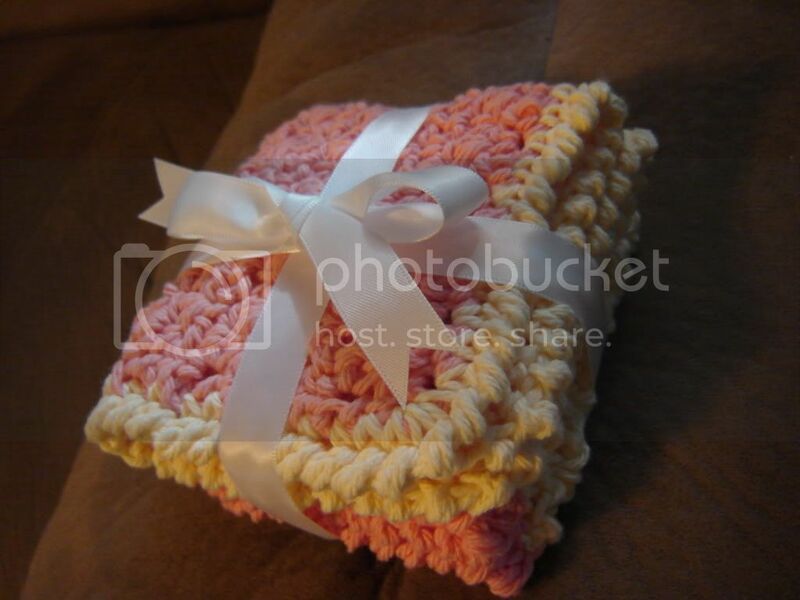 Thanks for the pattern I was looking for a good crochet pattern for baby washcloths. My mother knitted some for my son, but that isn't something I know how to do. Just sc across is too stiff, but this looks like a nice pattern! thanks for the pattern. These are going to be perfect for the next round of babies we are expecting at work! This is an awesome pattern. I'm starting a few for the baby I'll have in October. Thank you! And best wishes for you and your wonderful new addition! I extended the pattern to have a longer foundation and more rows and they are awesome washcloths/dishcloths for me =) I love how I can make them so fast and give them to friends for their babies too! I'm so glad you like the pattern! I have also changed it up a bit by starting with a ch of 31, and not adding the edging for dishcloths. 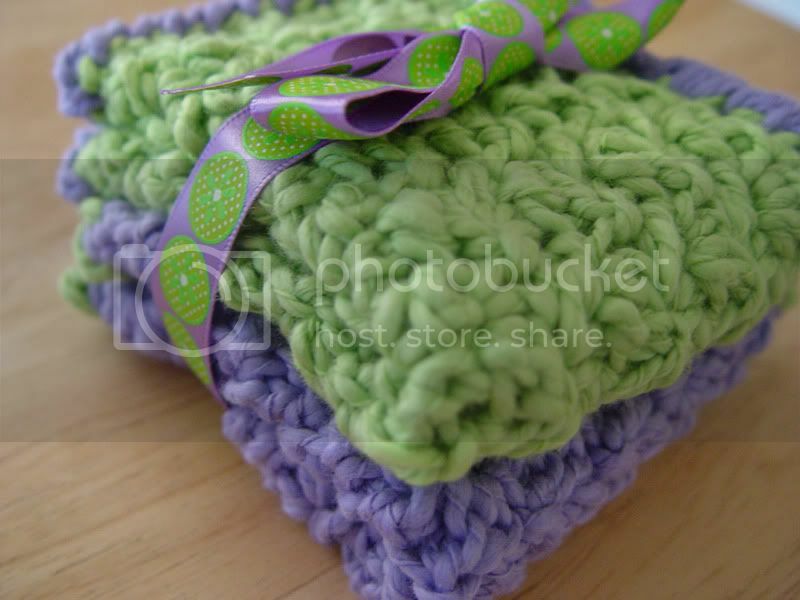 I made them with Knit Picks Cotlin (love Cotlin for dishcloths)! Love them!